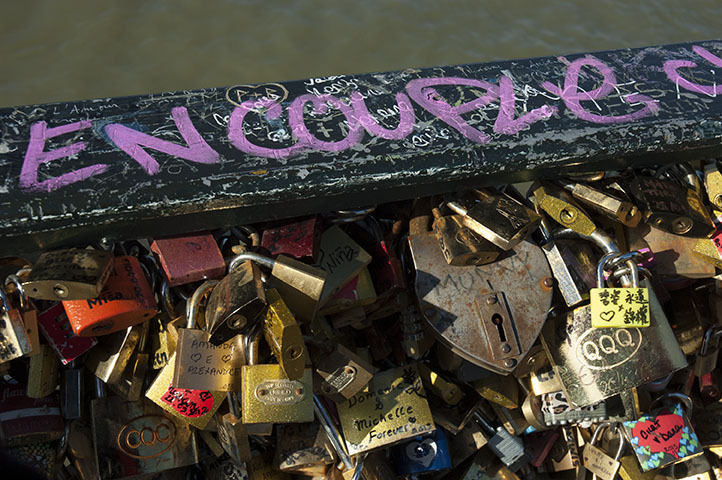 No Love Locks™ was founded by two friends—both named Lisa—who have chosen to call Paris home, and who have become increasingly concerned about the damage being caused by the tens of thousands of heavy locks being attached to several of the city’s historic bridges. 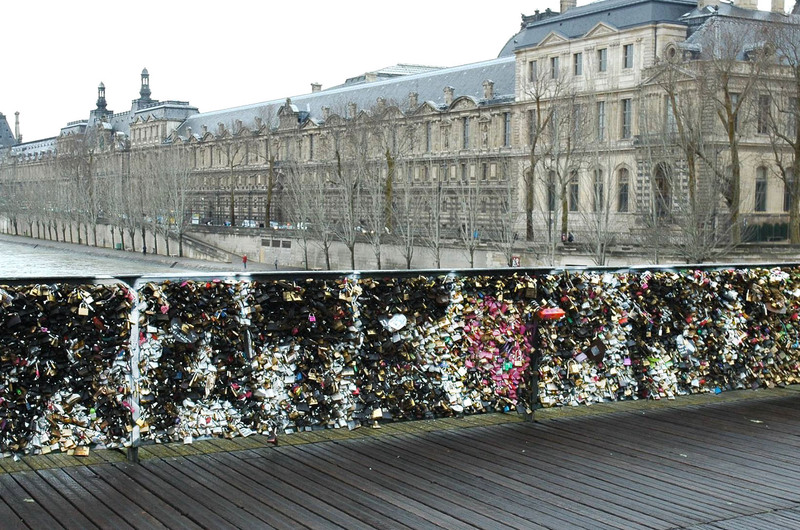 No Love Locks seeks to educate people and help them find less destructive ways to show their love. Free Your Love. Save Our Bridges. I hadn’t been paying attention to the bridges in the center of the city; I was too busy building a life in the 11th arrondissement. Then in November, I saw what had become of the Pont de l’Archevêché, a tiny bridge that connects Notre Dame with Quai de Montebello. In what seemed like mere months, it had been inundated by an infestation of locks, a dense metallic clump of “love,” that crept over the side of the bridge like a fungus. And the size of some locks was shocking—huge, some up to four inches across (10cm). Heavy bike locks had been attached to the bridge, seemingly to create an additional surface for hanging more locks since all the available meshing was used up. Graffiti had sprouted on the stone wall where locks were unable to be attached. People had taken to scratching messages in the paint on the railing. This wasn’t love. It felt like madness, like an invading army had seized the bridge. 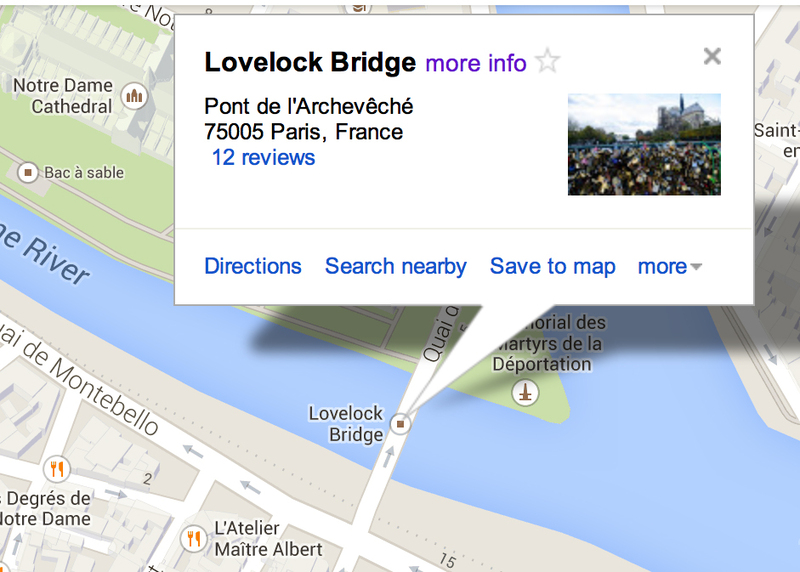 I’d known the Pont des Arts was falling prey to this mania, but now this bridge? I became like a crazy person. This was a bridge too far. I dashed off a post on my blog, My (Part-time) Paris Life, which went viral, lighting a fire under my friend Lisa—and the rest is history. 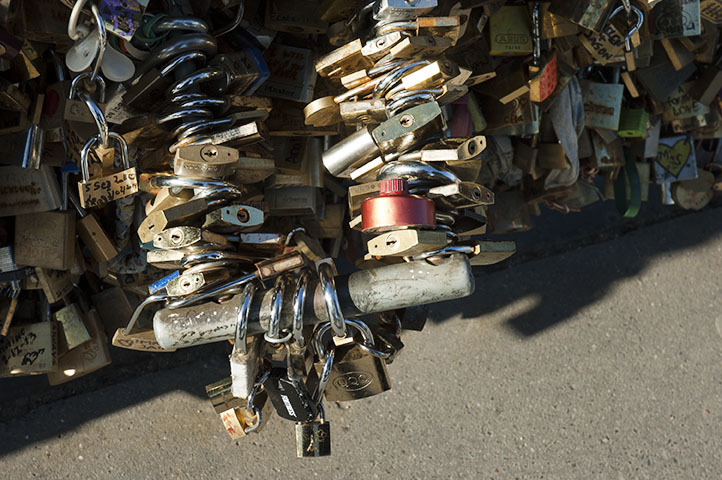 No Love Locks was born. We’ve since discovered that Pont de l’Archevêché is known as “Lovelock Bridge”—say what?—and is touted as such by tour guides and Google maps alike. That’s hair-pulling stuff. Were Lisa and I the only ones who thought this was a bad idea? Seems not. Our followers are increasing faster than we would have imagined, and we’ve already been tweeted and re-tweeted, blogged and re-blogged just a few weeks into our project. Now, the press is taking notice. Our petition (ici en français), launched on 9 March, has garnered more than 1,000 signatures in just over five days. In our latest effort, we’ve sent an open letter to the candidates for the March municipal elections in Paris, asking them for their position on the issue. We await their responses. It’s official: We’re a movement. For those not convinced, or on the fence, stay with us; what you will see in coming posts may surprise you—and change your mind. We’re not kooks or love-haters; we’re reasonable human beings who want to protect historic structures—and the beauty of our cities—from what’s sadly become rampant vandalism. Join us, will you? Sign our petition today. Whoa, folks. Give it a rest, huh? Oh, come on now. A bicycle lock? Really? Well, it was a pretty view…once. Locks creeping over the side like fungus. In 2008, “love locks” began to appear on the historic Pont des Arts in Paris, France. Since then, this trend has spread to other bridges in Paris, presenting a mounting problem of costly maintenance, ecological damage, security issues, and the degradation of cherished historic structures. This is not love. 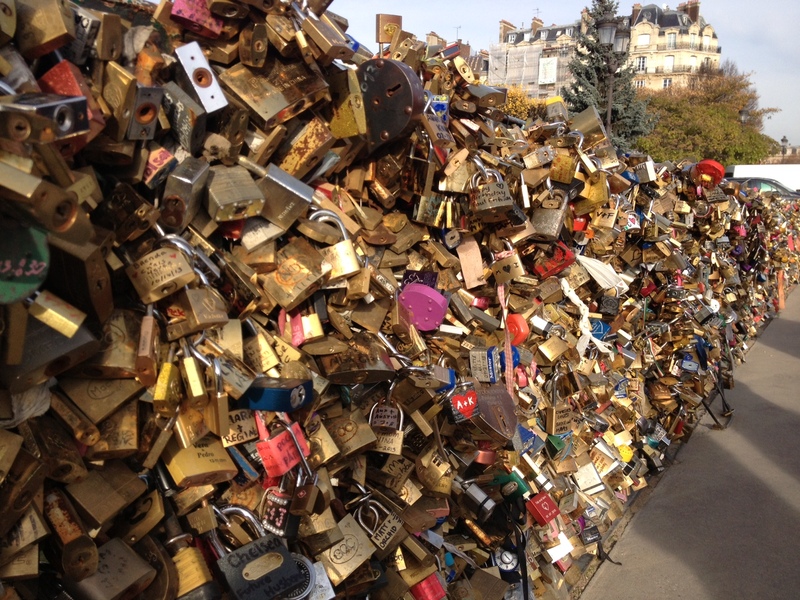 The time has come to enact a ban on “love locks” and restore our bridges to their original beauty and purpose. Help us stop “love locks!” Sign and share our petition on change.org and within your social network, available in English and French. We will be posting translations to other languages on this blog, for those who need them. Stay tuned. It doesn’t matter if you live in Paris or elsewhere, and you don’t have to be French to sign. We want the Paris city government to know that Parisians and visitors alike care deeply about this issue! Join us! One of the most odious side effects of the Love Locks is the graffiti that has begun to appear on the bridges—the surrounding stone walls, the railings, and even on the wall of locks themselves. While graffiti artists, like Banksy, arguably have a solid place in the world of art, in the case of the Pont des Arts (and other bridges), this graffiti is less about individual artistic expression and more about a mob out of control. It’s as if the very presence of the locks has breached an invisible boundary of social restraint and respect, of human decency, and has released the feeding frenzy. We are at a critical tipping point between dignity and savagery, like William Golding’s boys in Lord of the Flies who, once they put that pig’s head on a stick, surrendered to their baser selves. Removing graffiti from stone is an expensive proposition. Is the Pont Neuf, Paris’s oldest bridge (1578), safe? That the locks seem to have beget the graffiti is proof that the act of putting a lock on a public structure is mentally akin to vandalism. Proof, too, that the locks need to be treated as a nuisance, and regulated. Even those pro-lock can easily see how the graffiti defaces and disfigures the bridges, and in turn the entire center of Paris. What were once elegant and stately structures, now look more like train trestles in an abandoned section of Detroit, Michigan, USA—where these are signs of a city in decline. Is this also true of Paris? The wall of locks create the perfect solid surface for graffiti. You can make out the letters R-A-T-R and some others sprayed over top the locks. It took someone a significant amount of time to do this. That this is is able to happen unchecked—so close to police headquarters—is bewildering. How bad does it have to get before the government takes action? I first came to Paris in April of 1998. I was only here for three short days, taking the weekend for myself in the middle of a 2-week business trip in Germany, excited to finally visit the city of my dreams. I had found a charming little hotel on the Rue Bonaparte in the 6th arrondissement, just down the street from Hemingway’s haunt, the café Les Deux Magots. My chambre was an attic room with original wood beams, pink and white toile wallpaper, and a view of the dome of the Institut de France. Just beyond that dome was the Seine, and the Pont des Arts, and the views I had imagined for decades but had never seen with my own eyes. The first order of business after I settled in was to walk immediately to that classic bridge. I stood there for long minutes, at the very heart of Paris, seeing the Eiffel Tower for the first time, watching the bateaux-mouches pass below and waving at fellow tourists, and soaking up that view of the Ile de la Cité and the Pont Neuf which has been my favorite view in all of Paris ever since. I was alone, but not at all lonely: I was finally in Paris, at last! And it was as magical as I’d always pictured it. Me, “my” bridge and “my” view. It was simply perfect… BEFORE. 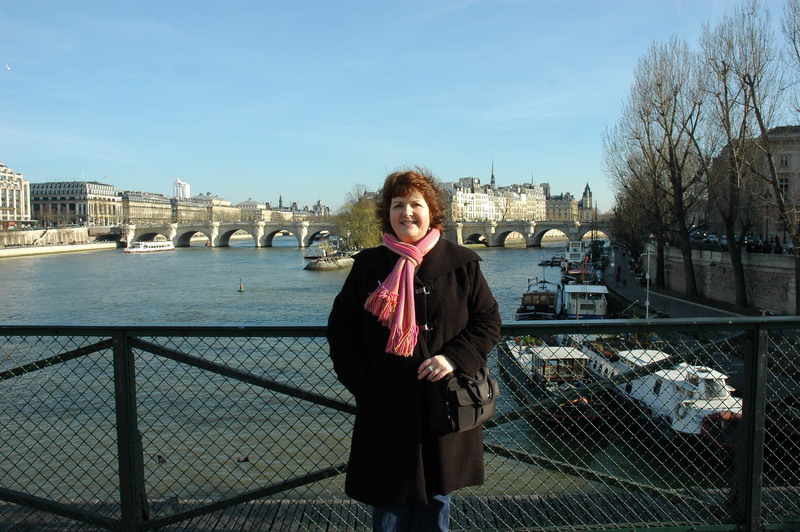 I next came to Paris in May of 2001, specifically to celebrate my 40th birthday. This time, my mother came along as my traveling companion. We weren’t able to get a room in that same hotel, but they had a sister hotel just a few blocks away on the tiny Rue Grégoire de Tours, just deus pas from Odéon. On that trip, too, the first thing we did, Mom and I, was to walk toward the river so I could share my favorite view with her. And it was exactly as I’d remembered: the Pont des Arts hadn’t changed a bit, with its graceful steel arches and light, simple design. The bridge’s unassuming demeanor allowed those strolling across it to slow down—even to sit down, on one of its wooden benches—and soak in the wonderful views in all directions, and to simply enjoy being in the moment. The bridge wasn’t the big attraction: Paris was. And that, as I thought then and still think today, was exactly as it ought to be. 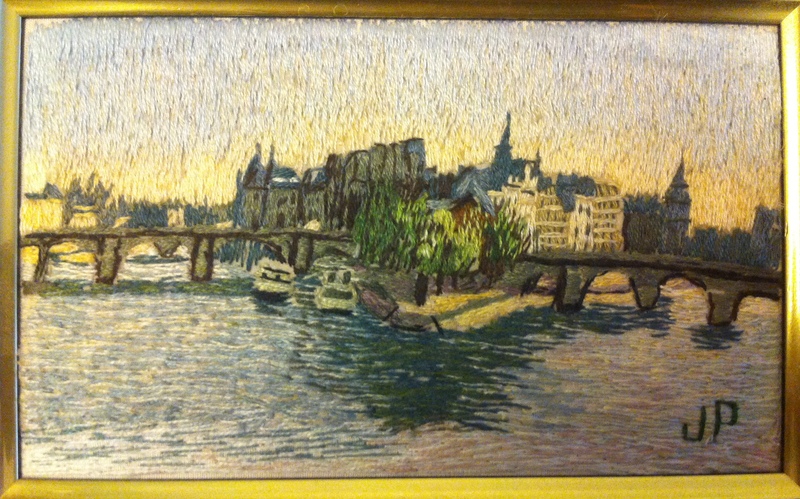 On that birthday trip, my mother and I happened upon an art fair in the gardens behind Notre Dame, where I discovered the most beautiful, small, framed piece of embroidery: It was my favorite view! I still have that sweet little piece of needlework, one of my most treasured souvenirs of any trip anywhere. When I moved to Paris in 2006, I came back to “my” bridge (I had long since claimed it as my own, in my heart, along with that view) at the earliest opportunity. All was exactly as I had left it: the bateaux-mouches were still passing underneath, and lovers were stopping to kiss on that bridge. It seemed designed for lovers to kiss upon, without the noise and distraction of cars. I dreamed of a day when I, too, might be able to stop for a romantic moment on that very spot, with someone I loved. I didn’t have to wait very long. In October of the following year, I met the man who would soon afterward become my husband. On our first Valentine’s Day together, in 2008, we decided to take a little “getaway”, though we didn’t go far: we took a room in the hotel on Rue Bonaparte, and acted like tourists in love. We took a little pique-nique à deux on a bench on the Pont des Arts. So what if it was February? The sun was shining, we had wine, bread and cheese, we had that incredible (still locks-free) view, and we had each other. We never needed a lock to seal our love, or our memories, on that bridge or any other. We would no more have thought of defiling that bridge with a lock or scratching our names into the railings than we would have spray-painted our names on the side of Notre Dame; it would have been pure sacrilege. 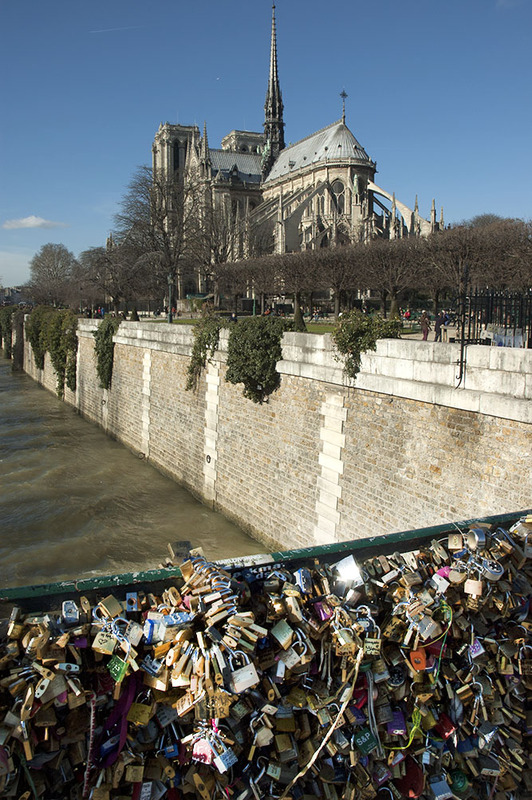 Sadly, 2008 was the year when people started attaching locks to the Pont des Arts, no doubt finding their inspiration in early media stories of the same thing happening in Florence or Rome, or in Asian cities far away (though the exact source of this trend is still unknown). The media and the tourism industry are, in large part, responsible for over-romanticizing and spreading the trend; they don’t care about impact on the bridges or the cities in question, they want to make money. Today, when you want to stroll on the Pont des Arts, the first thing you notice isn’t the views, or being at the very center of Paris; no, the first thing you notice are the ponderous layers upon layers of locks. It’s a phenomenon that makes a very strong impression. At first, you might be tempted to think the locks are beautiful, because the people who attached them there did so out of love. But look more closely, because those love tokens left by tens of thousands of couples are rusting faster than you can say “croissant”. And the tens of thousands of matching keys to those locks? Also rusting, at the bottom of the Seine, where they only contribute to the ecological problems this river has already been combatting for many years. Valentine’s Day, 2014, the Pont des Arts: nothing but rusting locks, blocked views, and graffiti declaring “Love is dead”. And on this bridge? Maybe it is. The locks have killed the love. 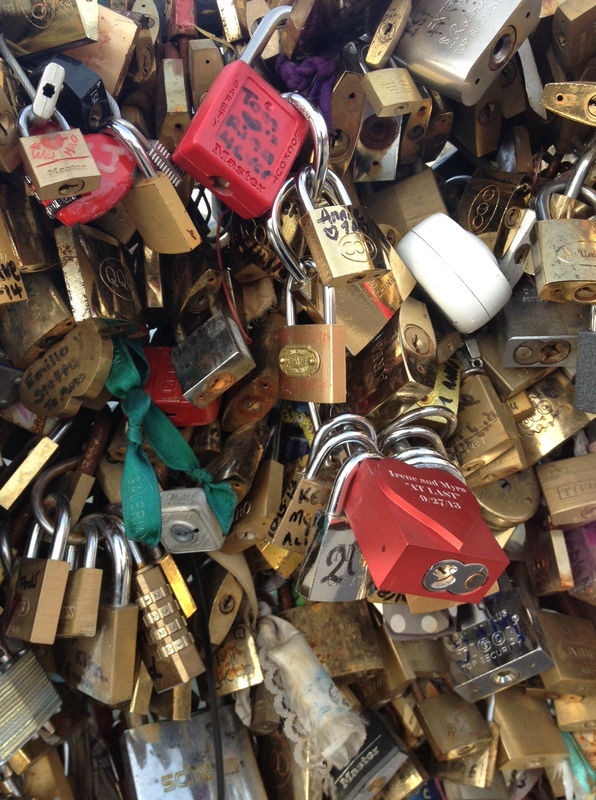 This is why I am so saddened and frustrated by the scourge of “love” locks. I know they were put there by people seeking to create some sort of special memory. But their thinking was incredibly short-sighted, not to mention selfish, because while they got their romantic moment, it was soon over and they left Paris, going back to their own lives. Those of us who have to live with and look at the ugly aftermath (not to mention that our taxes now have to go toward repairing the damage caused by all that “love”) are not amused. We don’t see love; we see vandalism. For me, and for many others both here and abroad who share my love of this city and all that is special about it, our memories aren’t of a bridge overrun by hunks of steel, and the ugly graffiti that has come along with it. We remember that we used to come to the Pont des Arts to relax, to take in the scenery, perhaps even to do a little kissing with someone special. Who really wants to go and spend time there now? It’s ugly, it’s swarming with tourists taking pictures and even climbing up the lamp posts to hang locks (which is not only dangerous, but reckless and stupid), and it attracts illegal street vendors selling locks, not to mention dozens (I counted) of pickpockets and scam artists. You can’t sit and enjoy the views, because the formerly view-friendly fencing is now littered in thousands of individual acts of vandalism, and because the crowds of lock-hangers and voyeurs are too thick. 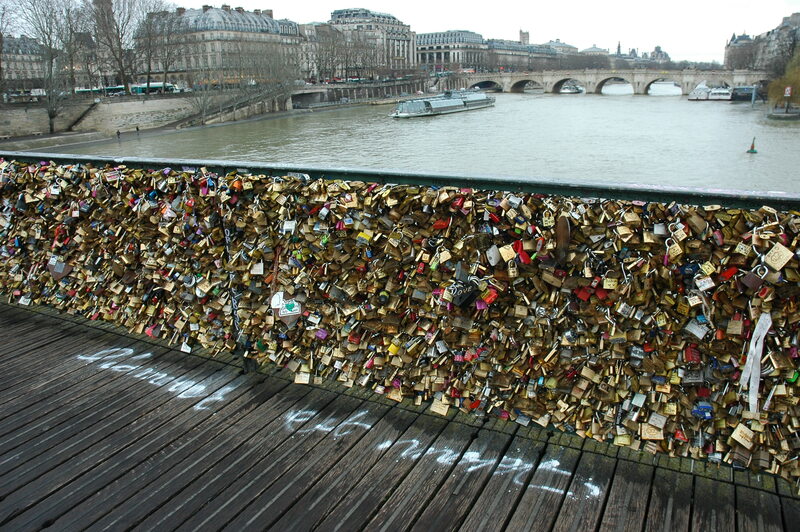 The soul of the Pont des Arts is simply gone, sacrificed to a bunch of locks in a deeply misguided expression of amour. When did it become legally and socially permissible for someone to come along and commit vandalism on a beautiful historic structure in the name of “creating a special memory”? What about the rest of us, both Parisians and travelers alike, who love Paris and its very special character? When you try to lock up our bridges and our views, you are also locking up our memories and degrading the very nature of the city. You are taking something that was once beautiful and special, something that was one-of-a-kind, and turning it into little more than trash. You can try to dress it up and call it “love” if you want, but THE PICTURES DON’T LIE. Trash is still trash. SIGN OUR PETITION AND RESTORE THE BEAUTY AND ROMANCE TO OUR BRIDGES.